Christmas is right around the corner and that means Santa, presents, memories and holiday traditions. One of my favorite holiday traditions started 10 years ago when my first child was just 9 months old... brand new Christmas pajamas. 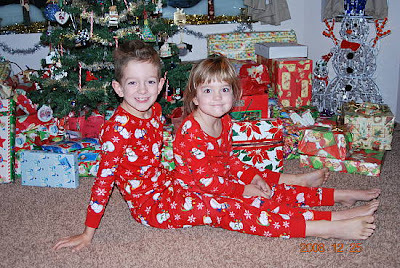 I give them their brand new Christmas pajamas (usually matching) on Christmas Eve and that's what they were to bed. Brand new jammies, sweet dreams of Santa, Rudolph and presents. It also makes for perfect photo memories of Christmas morning! My favorite Christmas cards have always been photo cards. I love getting family photos and pictures of children that I don't get to see on a regular basis throughout the year. I'm always stunned at how much the kids have grown and changed over the course of a year. ONE DAY ONLY (Wednesday November, 9) - you can receive a FREE card to your kids from Santa! 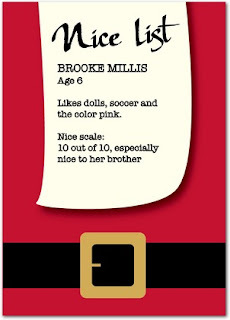 Visit the Tiny Prints Facebook page to find out how to personalize one of the following greeting cards FREE: Checking It Twice or Santa’s Scroll. Hurry! This offer ends 11/9/11 at 11:59 pm (PT). Looking for the perfect Christmas cards? Well, look no further. We have tons of Christmas cards to choose from that are sure to fit every style and budget. For the lover of all things modern, choose from Christmas cards with fun text and playful patterns. For the traditionalist, we have tons of Christmas cards with reindeers, Santa Claus, pretty presents, Christmas lights and Christmas trees that are sure to get you in the holiday spirit. And for the DIY enthusiast, we have cards that capture that hand-made feeling. Plus, don't forget, adding a family photo to your Christmas card is the perfect way to customize it and make it stand out on the mantel. Your friends and family will love seeing your picture front and center on their Christmas card. Aside from all the different styles of Christmas cards, Tiny Prints offers different formats that are sure to get noticed. From flat to folded and even circle cards, there's a style that's sure to catch your eye and express your unique personality. You can also find Christmas cards that let you include anywhere from one to eight photos. With all the options, the possibilities are endless. And that means your Christmas card is guaranteed to be the talk of all your friends and family. I love the Christmas collage cards! love the Merry Modest card! I love the Christmas Flourish Bright Red cards! The Christmas collage cards are too cute!